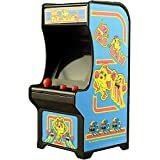 It's been decades since the classic arcade games were brand new in their glorious full-size cabinets and sucking in endless quarters from eager players hoping to top the high score. 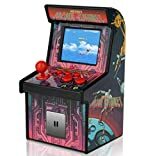 Well, those original arcade cabinets still fetch quite a high price if you've always wanted one for your home, but I think I found a much more reasonably priced and ultra space-saving solution. 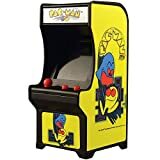 These cool new Tiny Arcade Games are fully functional miniature arcade game replicas of some of the greatest titles in video game history like Space Invaders, Pac-Man, Ms. Pac-Man, and Galaxian. Each comes complete with a tiny arcade cabinet with authentic joystick and button controls, full color hi-res graphics, and authentic sounds. The cabinet even has a backlit header and includes a keychain to take your nostalgia with you on the go. I hope they release even more games in the future so I can have my very own 80s mall arcade setup right on my desk. Best of all, no coins need to be inserted to play. Screen size: 1.5" x 1"
Size: 4" x 2" x 2"